Trump has been given a plan to defeat ISIS. Why isn’t he acting on it? Whatever Happened to the Plan to Defeat ISIS? Defeating the jihadi group used to be Trump’s top priority. Now he seems to have forgotten about it just as the battle has reached its bloody climax. 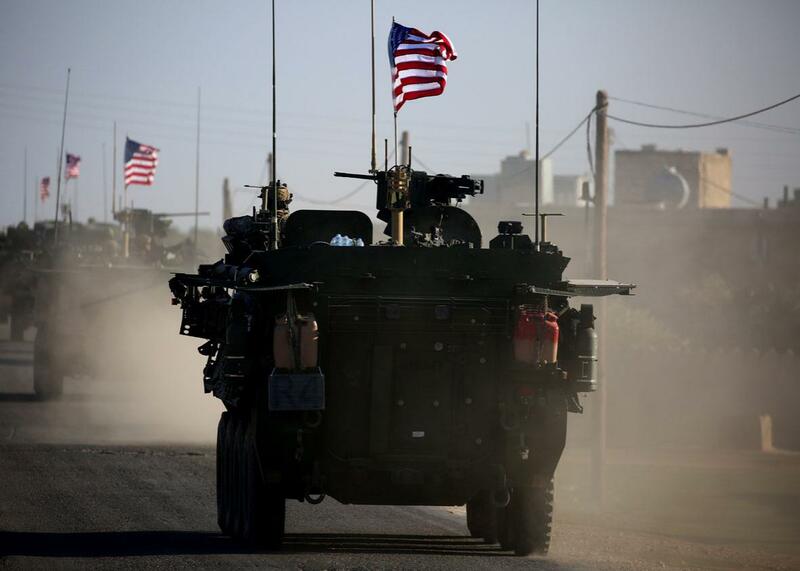 A convoy of U.S. forces’ armoured vehicles drives near the village of Yalanli, on the western outskirts of the northern Syrian city of Manbij, on March 5. On Jan. 28, President Trump ordered Secretary of Defense James Mattis to devise a plan, within 30 days, on how to defeat ISIS. Mattis turned in his report on Feb. 27, and, according to senior officials, it is still sitting in the White House. In the 70 days since it landed on his desk, Trump has not responded to it, modified it, or approved it as policy. In other words, despite Trump’s claim during the election campaign that he had a plan for beating ISIS, and his later claim that he would ask the generals if they had a better idea and act on it quickly if they did, the administration has no plan—no overarching strategy—for defeating the fighters and propagandists of the Islamic State. This may be one reason for the recent surge of civilian casualties in Mosul. In this latest phase of fighting, ISIS militiamen have often herded residents—those who have stayed—into a building, then put a sniper up on the roof. The idea is either to deter Iraqi soldiers and U.S. fighter planes from bombing the building, knowing that dozens of civilians would die—or to lure them to destroy the building, in the hope that the survivors and the relatives of those killed will blame the Iraqis and the Americans for the carnage, thus reigniting opposition to the Baghdad government and the U.S. military. The ISIS commanders seem on the verge of defeat in Iraq; the battle for Mosul is their last stand. But they also understand that the war is shifting to a new phase—to the struggle for who controls Iraq (and Syria) even after they’re diminished or defeated on the battlefield. And they are fighting in a way that has the best chance of sustaining the chaos and instability—conditions on which their rebellion thrives. In fact, all the local combatants are positioning themselves for the next phase. The fighting in Mosul is so intense, in good part, because one of the leaders in the anti–ISIS coalition, the Popular Mobilization Forces (PMF), wants it to be intense. On paper, the PMF—which comprises more than one-third of the allied fighters in Mosul—has been incorporated into the Iraqi army, but in fact, it remains true to its origins as a Shiite militia, backed by—and loyal to—Iran. During the run-up to the battle for Mosul, U.S. military advisers wanted to keep a route clear, so that ISIS militias could evacuate the city. First, it would be easier to pummel the militias out in the open than to engage them in door-to-door urban combat. Second, fewer civilians trapped in the city would be killed, and fewer homes would be destroyed. But, according to a senior officer involved in these discussions, the PMF leaders rejected the advice. Their goal, all along, has been to establish Shiite dominance throughout Iraq—especially in the province of Nineveh, of which Mosul is the capital. They want to punish Mosul, a majority Sunni city. And they want to weaken the Iraqi Security Forces, the country’s established army, which has taken the brunt of casualties in the urban war of attrition, thus leaving the PMF as Iraq’s dominant military force. So the noose was wrapped entirely around Mosul, with no escape routes, and ISIS dug in to fight. The Iraqi army’s approach to this sort of battle plays right into the PMF’s desire for maximum destruction. As they have shown in previous battles over the years—Ramadi, Fallujah, Bayii, and Sinjar—Iraqi officers don’t bother with the delicate task of clearing buildings that the enemy occupies. Instead, they flatten the buildings, then occupy the rubble. That’s what has happened in Mosul; it has made the fighting more intense, and it will make the recovery more prolonged and difficult. The combatants’ rush to position themselves for the era after the fall of ISIS—whether the era is one of negotiations or further conflict—also explains Turkey’s recent airstrikes against the Kurdish militias that have been the United States’ most effective allies in the fight against Islamic State on the Syrian side of the border. This is why, as the defeat of ISIS draws near, the lack of a coherent U.S. strategy—or, more precisely, Trump’s hesitation or refusal to accept, adapt, or do something with Mattis’ plan—is such a source of anxiety. All the other players in this politico-military fight—the leaders of Iraq, Syria, Iran, Russia, Turkey, the Gulf States, the Sunni powers (especially Saudi Arabia), and the various militias, whether jihadist or anti-jihadist—know what their interests are and how they want the game to play out. Only the United States doesn’t know, or hasn’t clearly expressed, its interests and desires. One senior official put it to me bluntly: “There is no clearly articulated end-point.” Yet this is what strategy is about: aligning a nation-state’s interests with the resources it wants to commit to fulfilling those interests. Trump is escalating U.S.–military involvement in all the battles of the region, but without a strategy—without an “articulated end-point”—escalation is senseless. As Trump has discovered about health care and every other issue that he takes a look at, the fight against ISIS is a lot more complicated than he’d thought. Mattis has ideas, but neither he nor anyone else in the administration can put them in motion until the president decides just what it is he wants to do. We may be waiting a long time for that to happen, as the chaos continues to spiral and the bombs continue to fall.